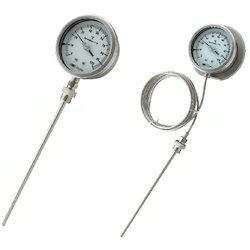 Pioneers in the industry, we offer industrial thermometer bimetal and industrial thermometer filled system from India. We zare one of the leading wholesale traders & suppliers of Industrial Thermometer Bimetal. We are one of the leading wholesaletraders and suppliers of Industrial Thermometer Filled System. Inert gas filled expansion system. Such design is generally used in all industries, machinery manufactures, bearing temp. measurement etc. where space is limited. Looking for Temp Gauge ?